The remnants of a family torn apart by grief learn to reconnect in a foreign land in Genova. The film begins with a tragic car accident which takes the life of wife and mother Marianne (Hope Davis). Afterward, grieving husband and college professor Joe (Colin Firth) uproots his family from the winter chill of middle class suburbia, America, to the maritime town of Genova, Italy, where Joe has accepted a teaching position. The picturesque city plays both backdrop and muse to the suppressed emotions of its characters, especially Joe’s two daughters Kelly (Willa Holland) and Mary (Perla Haney-Jardine). Adequately annoying adolescent Kelly finds opportunities to develop her rebellious side and explore her sexuality, spending most nights speeding along the cobblestone streets on the back of Vespers with a succession of Italian boys. Young Mary, however, embarks on a spiritual journey of redemption, tackling the guilt of her non-intentional part in her mothers death, through a succession of nightmares and spiritual apparitions of her mother, with the moments between Haney-Jardine and Davis filled with tenderness, and establishing a soulful core. Haney-Jardine (who made her debut as the daughter of Uma Thurman’s vengeful Bride in Kill Bill Vol.2) delivers a performance of stunning fragility and soul which transcends her young years. So to do her co-stars provide fine work, with Firth in particular displaying a fine example of grief in quiet transition. With such naturalistic performances, it is of no surprise to find that Michael Winterbottom is behind the lens, using his documentarian touch to induce realistic actions and reactions from his cast, which includes Catherine Keener as the lovelorn Barbara. Of particular benefit to Winterbottom’s story is the beautiful city from which the film borrowed its title. Intelligent enough not to frame his shots as if it were a picture postcard, Winterbottom opts to capture Genova from within, walking the labyrinth alleys and soaking in the culture, churches, and people of this land which is filled with history, beauty, and an unknowing danger to its new inhabitants. 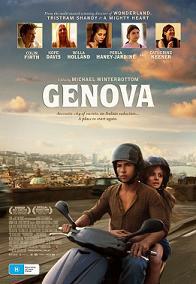 A soulful and cliché free tale of redemption, Genova is a fine addition to Winterbottom’s varied filmography.